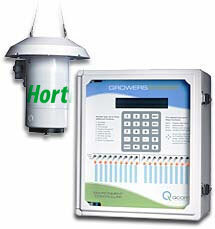 The Grower’s Choice automates on/off equipment (fans, pumps, heaters, misters, foggers and irrigation valves), and proportional devices (vents, curtains, valves, etc.). Virtually any device can be precisely controlled with GROWER’S CHOICE. This low-cost unit controls up to 24 different outputs and can integrate zone information with outdoor information. The Grower’s Choice gives you the precision you need in your controlled environment at a very competitive price, making it ideal for small to medium single-zone operations. GROWER’S CHOICE is the SMART CHOICE! Check out some of the benefits of this system. Note: The Grower’s Choice Controller can be linked via this communications interface to a host computer, and other GC controllers. For more information see the GC-Connect system, which utilizes this networked approach.